The new Wornstar Immortals clothing line is tailored to fans of the MMA lifestyle and endorsed by MMA Featherweight Champ Pat Curran. Wornstar Clothing, rock 'n' roll clothing company for members of high-profile bands including Evanescence, Five Finger Death Punch, Hellyeah, Sevendust, Halestorm, Megadeth, Saliva, Black Label Society, Trace Adkins, Luke Bryan, Alter Bridge, Creed and more, is launching their new line of MMA-inspired clothing--Wornstar Immortals--endorsed by Bellator MMA Featherweight World Champion Pat Curran. “We’ve always been big fans of Mixed Martial Arts (MMA), and the styles used in the sport share a lot of similarities with our rock 'n' roll brand, so it was a natural extension of what we were doing and fits in nicely with our line. We’re excited that the Wornstar Immortals line is being embraced equally by our rock 'n' roll clients and fans as well as several MMA fighters and fans,” said Wornstar Designer and CEO Stephen Jensen. “Wornstar Clothing’s style is what struck me first--they were offering something different to the MMA world. They had more of a rock 'n' roll edge to their clothing. And when I tried it out, I was sold. The quality is great. The shirts are super soft and very comfortable when I’m training. 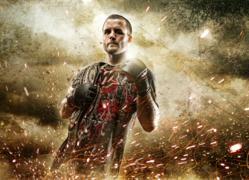 I’m proud to be representing a brand I believe in,” said new Wornstar spokesperson and MMA champ Pat Curran. Wornstar Clothing is proud to be partnering with hometown fighter Pat Curran, who trains out of Team Curran MMA in Crystal Lake, IL. Pat will be wearing Wornstar Immortals as his walkout shirt when he fights to defend his Featherweight World Title at his next Bellator MMA match April 4th v. Shahbulat Shamhalaev, live on Spike TV. Wornstar Clothing was created by professional rock 'n' roll photographer and art director Stephen Jensen along with his wife, professional stylist and clothing designer Sylvia Jensen, as an extension of their business F3 Studios. What began as a small side business to fill in some creative gaps when styling photo shoots has quickly grown to one of the most sought after rock 'n' roll clothing brands. The new Wornstar Immortals line, and the rest of the Wornstar Clothing line, are available online at their website and in their Crystal Lake, IL showroom. For more information, please visit http://wornstar.com or visit the Wornstar Showroom 732 Tek Drive, Suite D, Crystal Lake, IL 60014.